First Drive in in U.S. 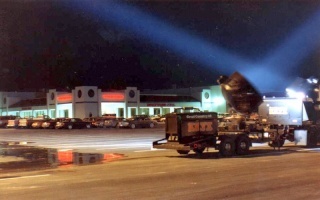 I remember going to the Fresh Pond Drive-In when my sister and I were still pre-teens. (my brother hadn't even come along yet). We had a lime-green Rambler station wagon, and every so often, we'd go out to dinner and then, having brought pillows and blankets, my sister and I would be in the back part of the station wagon, and either see the movie from there, or fall asleep. The Fresh Pond Drive-In is long gone, like most of the other Drive-Ins here in the United States, but memories linger on. The Natick Drive-In, in Natick, MA, was another neat drive-in, and there was another drive-in (whose name and location escapes me at the moment), where we saw many great films such as the Charlie Chaplin movies.